I feel like it’s been forever since I’ve written a post! Our Easter weekend was full of eating wonderful things, drinking wonderful things, and seeing wonderful people. I’ve been on spring break (it has been glorious!) and have had the time to cook a bit more, too. Thus this week, we wanted to eat a few meals that were a bit more healthy for our waistlines. I found this recipe in one of my Rachael Ray cookbooks that I occasionally sift through. After reading through the ingredients, I remembered that I had made this recipe before, when my husband & I were first married. It’s a great dish to serve, yet again, on a cold & snowy evening. And, wouldn’t you know it – it’s been snowing on and off all week up here in our neck of the woods. Spring, where are you?!?! 1. Bring a large pot of water to a boil. Boil pasta until al dente. 3. To the pot, add the onion, carrots, mushrooms, garlic, rosemary and red pepper flakes. Cook until the veggies soften; season with salt & pepper. 4. Add the red wine to the pan and let it simmer, deglazing the pan. Scrape the ‘browned bit’s off of the bottom. Then, add the tomatoes and chicken stock, and bring to a boil. Let simmer for about 5 minutes, then add the reserved browned chicken and pancetta back to the pot and continue to cook for 5-10 minutes more so that the flavors combine. 5. Remember that pasta you were making? Drain the water off. While it’s still hot, place some into the bottom of your serving bowls. Pour a ladle of stoup on the pasta, followed by a sprinkling of Romano cheese and parsley. Serve with crusty bread. I really love the flavors in this dish. The pancetta (an ingredient that I don’t use often) adds a really nice, smoky depth. 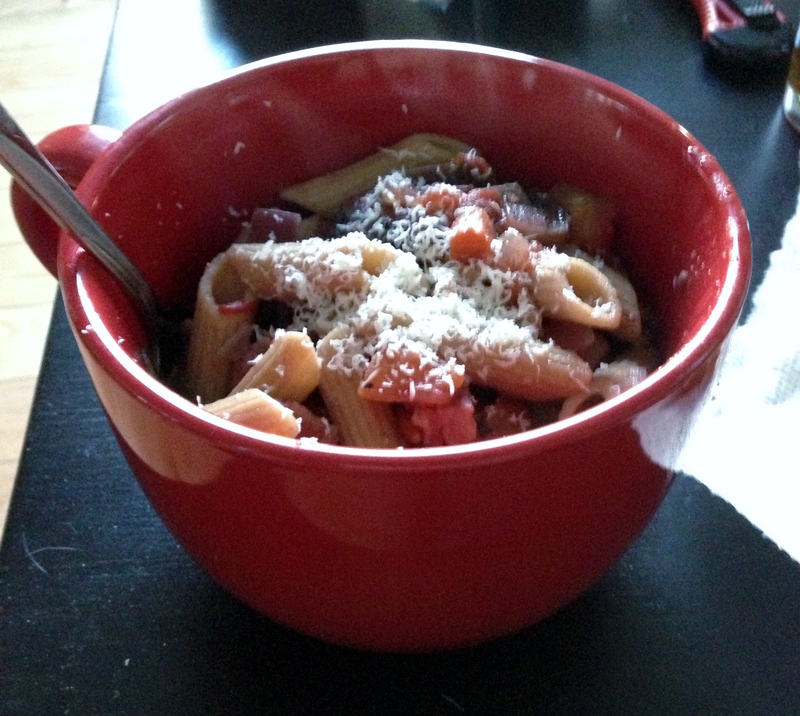 I made a lot of adaptations to this recipe based upon what I had on hand in my pantry, such as the tomatoes. You can also vary the amount of carrots you use in this dish, depending on if you’re a carrot fan or not. You could probably use celery as well, if you wanted. Hopefully, this will be the last of the thicker soup/stew posts for the next couple weeks. I know that all of us up here in Michigan are very tired of the snow and cold weather and are praying for the weather to break. At least the fruit farmers & maple syrup makers are happy!